A special filtering layer of NSF-certified activated carbon strips out bad tastes and odors in your water. Then a layer of Ion Exchange Resin softens the water. This stage makes your water taste great. Then in the second stage, magnesium, infrared ceramics, and tourmaline enrich the water with free hydrogen. 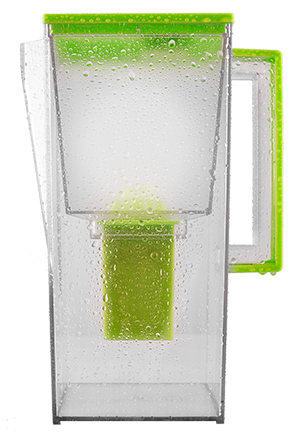 This water ionizing pitcher will transform the water you and your family drinks, and may be one of the best choices you make in your life when it comes to your health. You saw the demonstration showing how the most popular bottled water brands are oxidizing, and Turapür water is an antioxidant for your body. If you’re still not convinced that Turapür is a valuable addition to your household and your health, honestly it’s probably best you pass on this opportunity and let someone else who’s ready to improve their health, claim their Turapür today. I found myself waking up easier after 2 or 3 days of drinking Turapür water. Love it! We thought our water was 'good' until we purchased 2 pitchers... what a difference!!!! It's simply amazing how it turned our 'good' water into 'REALLY GREAT WATER'!!!! [We noticed an effect] the moment we started using our pitchers! And we feel that our 7 month old Sophia Rae (puppy) is getting the best water as well! It's just me and my husband and our puppy... we ALL have had a positive experience since using our 'FRESH WATER'! Just the best water we've ever had. It relieves headaches, muscle aches and energizes the body. I noticed the effects immediately. The first thing I noticed was the taste of the water. It's like healthy with minerals from a mountain stream or spring, not like bottle water. It makes me feel better after working and sweating in the yard. It tastes more fresh and clean than other waters I’ve tried. I feel energized in a calm way when I drink this really good water. Nothing like it on the market. Reminds me of when my parents had a fresh artesian spring bubbling up on their farm in Tennessee. No taste, but excellent thirst-quenching water! I have not been a consumer of tap water for years but have used a pitcher that took much more time to distill the water and then add back in the minerals and additional H2O2. The pitcher is so much easier and less time consuming. The biggest difference I actually saw was that my two cats love the water. They will not drink any other form of water and that says a lot. Thank you for making my life easier. I noticed a difference immediately. Turapür water has a smooth, clean taste and I feel more energetic. The water tastes great, like from a cold stream. The coffee, tea, and food I make with it tastes much better than with tap water. Other fortified, alkaline and artesian waters I’ve tried just don’t compare. An all-around great product! The water tastes great, and is very refreshing. I have to tell you, that my wife was very upset, because we already had a Brita. However, I convinced her to try it side by side the Brita. She could not believe the difference! I feel more energetic, and my skin is not as dry. About the third day I could really tell a difference. I don’t even think about soft drinks anymore. I have more energy and my facial skin has improved. Turapür water is better than other waters. Water was very clear. I seem to have more energy since drinking the hydrogen water. No comparison to other water. This is the best! The water tastes better - even better than Fuji! I am more hydrated and notice my skin is looking better. My skin looks better and the coffee and tea I make with the water tastes so much better. My friends really like it too and have ordered pitchers for themselves. I noticed more energy almost immediately. I am also drinking much more than before I got my pitcher. The water tastes fresh, very fresh. This purchase was some of the best money I have ever spent.